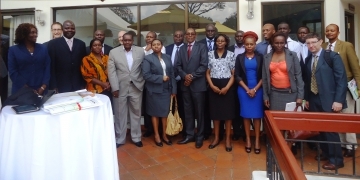 There were participants from academia and from several institutions involved with water policy including the State Department of Water at the Ministry of Environment, Water and Natural Resources, Athi Water Services Board and Nairobi City Water and Sewerage Company. The meeting was opened by Eng. Samuel Alima (Deputy Director, Water and Sanitation) on behalf of Eng. Simitu (Director, State Department of Water, Ministry of Environment). Prof. Dale Whittington gave an illuminating presentation on Global Context on Water Policy. Two EfD-K projects were presented at the Policy Day. David Fuente presented preliminary findings from the Increasing Block Tariffs and Subsidy Incidence project and Joe Cook did the same for the Water Sourcing in Rural Kenya project. Please download the workshop report below.